We recently learned our former upstairs neighbor in New York passed away at the end of December. Now, it’s fair to say his body was no temple, but to go in your sixties seems too soon, even if that age did match his favorite decade. We weren’t terribly close to him, but we were extremely fond of him. In Seinfeldian terms, he was our Kramer: the man who lived in a separate apartment so close in proximity, he may as well have lived in our bathroom; the man who stopped us on the stoop to tell a long winded story when we were obviously in a hurry; the man we really didn’t KNOW, but SAW constantly, sometimes every day for over ten years. He was a fully painted character in our story lived out on the Upper West Side. 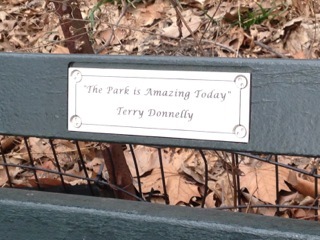 His sister sent me this photo of the plaque on a bench in Central Park to honor him. Apparently, the quote above his name was something he said all the time. Below, I shared an edited favorite story about Terry. I’ve shared it before, but it seems like the right time to pull it out from the archives. Our former upstairs neighbor, Terry, claimed to be an ‘entertainment lawyer’ at some point in his life. In his heyday, he ‘worked’ with the likes of John Lennon, Mick Jagger, Slash, Roger Waters, Steven Tyler-the list goes on. I’m not entirely sure any of this is true-I actually never believed anything he said. He had a stoma, a large air hole, in his throat from too much smoking-so he always wore a bandana around his neck. Always. When he spoke, he placed his hand over this wind hole to produce a rough, raspy voice similar to a masculine Marge Simpson. For the record-I am terribly fond of him. When I passed him on the stairs he would regale me with stories and then tell me how great I looked. I won’t lie-this was nice to hear when I was postpartum and didn’t sleep, exercise or eat anything but Oreos for three months straight. One day, my now husband/then boyfriend and I saw him try to stuff a giant cardboard box into our recycling bin. 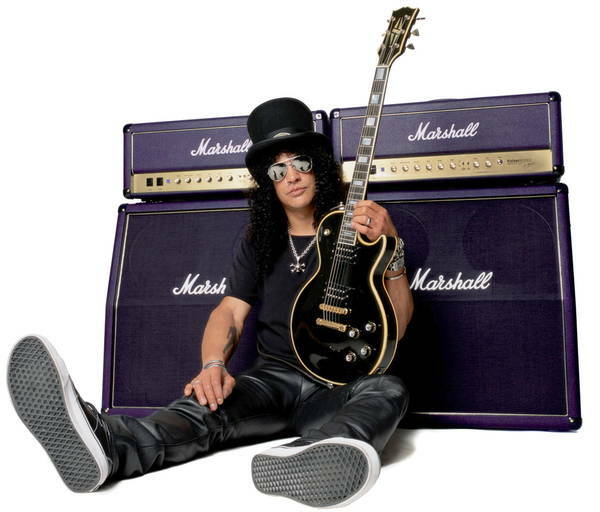 He told us Slash-the very famous guitarist from Guns and Roses-had sent him a large, flat screen TV. This was circa 2006-before everyone you knew had a giant flat screen TV. They still held a certain cache, if you will. Still, we didn’t believe him. A year later I attended an event with my now husband/then fiancé at the Wynn Hotel in Las Vegas-doesn’t that sound fancy? Rumor had it- somewhere in the giant ballroom lurked none other than Slash. He didn’t especially want to, but it didn’t matter. We never saw him, anyway. As the evening drew to a close, we walked back to our hotel room. There, in the distance, waaaaaaaaay out in front of us, drifted the tell-tale top hat of Slash himself. I quickened my step. Just as we arrived at the elevator banks, Slash and his wife stepped into the first car and the doors closed after them. Then a miracle happened. Slash opened the doors for us. What a gentleman. We slipped into the elevator and my brain lost the ability to form sentences. Here was our chance-it was just the four of us in here-just us, but I had no voice. I nudged my now husband as if to say-‘save this sinking ship!’ He did no such thing. Instead, we sat in that elevator, thought the same thoughts and wore the same goofy/demented smile on our face. Slash must still harbor regrets about holding those doors. The elevator reached our floor. I stepped out, thoroughly disappointed in our future as a united front. We were engaged now after all. If we couldn’t handle this together, what would we be able to handle? We’d now never know if Ted was, in fact, a teller of truths or not. Slash and his wife stepped out onto our floor too. We could still do it-there was still hope. They walked slowly behind us. I felt my heart beat inside my chest. Slash’s wife calls him Slash. OK. Well, that was it. Clearly, the powers that be had offered up an opportunity here. My husband shot me a look that said, ‘Don’t you dare bother him,’ but it was too late. When you are given not one, not two, but THREE chances to ask Slash a question-you had better do it. Until the birth of our son, that may have been the single greatest moment of our lives. I’ve been meaning to comment on this post over the past few days—it has really haunted me (in a good way). So poignant and beautifully written, not only it is a wonderful tribute, but it’s also such a quintessential New York story. Sounds like you contributed to his quality of life too. Great post!